I'm currently in the market for blog designers. Contact me if interested! This post is inspired by the lovely M, who is my boyfriend's sister and an utterly amazing cook! E's entire family is very much into cooking and I feel right at home with them. M made Eggplant Rollotini a few weeks ago and I found the recipe she used; I added spinach and Prosciutto into the mix to give a little more punch. Extras freeze well, and I find that, like lasagna or chili, the flavors of the Rollotini meld into one another well over a day or two, so you may want to prepare this a day in advance and then heat in the oven (the last step) the day you're serving. Either way, this recipe is well-received, and much more flavorful *and healthier* than traditionally served in restaurants! Cut the tops of your eggplant, and peel. Then cut eggplant lengthwise into 1/4 inch-thick vertical pieces with a sharp knife. Heavily salt both sides of the pieces of eggplant, and put in a baking dish. Let sit on the counter for 20-30 minutes to let the eggplant "sweat" out the bitterness. If you don't do this step, the eggplant will taste bitter. You'll see the eggplant literally release water and sweat! At this point, while your eggplant is sweating, preheat your oven to 400*. After this step, rinse the eggplant pieces under cool water and dry thoroughly with papertowels. Spray your foil-lined cookie sheet heavily with cooking spray. Mix your egg/eggwhites in one bowl, and mix your breadcrumbs and parmesan/romano cheese together in another bowl. 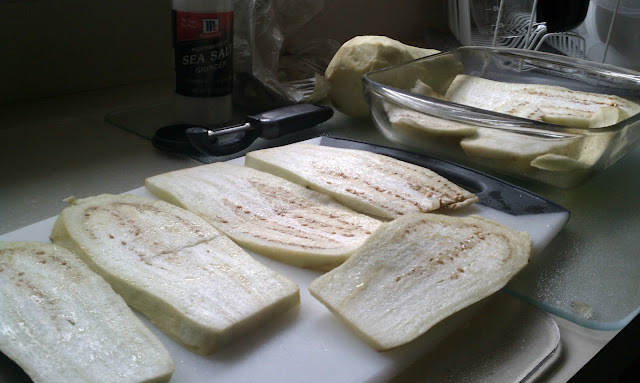 Dredge your eggplant slices in the egg, then the breading. Then place each carefully down on the foiled-and-oiled cookie sheet. Place in your oven and bake for about 7 minutes, then flip over and bake for another 5-7 minutes or until the eggplant begins to brown. Then remove and set aside. Turn oven down to 350*. Thaw the frozen spinach according to package directions. Mix ricotta and thawed spinach in a bowl, according to taste. I tend to use a lot of spinach, you may want to use less. Prepare a baking dish by layering about 1/2 cup tomato sauce on the bottom. Spoon about a tablespoon of the ricotta/spinach mixture onto one side of an eggplant slice. Layer one piece of Prosciutto on top, if desired. Roll eggplant up around the ricotta/spinach/Prosciutto, and lay seam-side-down onto the baking dish. Repeat for all eggplant slices. Cover with remaining tomato sauce, and shredded mozz cheese. Put into oven for about 12-15 minutes, until heated through and cheese is melty and toasty. You may want to set on Broil for a minute as well.